First placed in service in 1900 the Proteus was built by the Newport News Shipbuilding Company to a high standard. The luxury liner Proteus was a very well appointed and modern vessel capable of making good speed on her trips between New York and New Orleans. The Proteus served on this run for many years carrying passengers in comfort and freight in her holds for the Southern Pacific Company. Contemporary reports on the vessel's accommodations lauded the fact the staterooms were elegantly appointed; toilets and bath rooms were available for all those aboard and she had spacious round and rectangular portholes to provide excellent ventilation as well as electric lighting throughout. This along with the fact that independent mess facilities existed for the crewmembers, steerage passengers and the first class made for "passenger arrangements that could not be improved upon". On August 14, 1918, she left New Orleans for the last time. The liner made and uneventful journey until she encountered fog in the area offshore of North Carolina on Sunday, August 19th, causing Captain Boyd to order a reduced speed. The Proteus was also running without her navigation lights illuminated as was recommended during this period of World War I since German submarines were sinking vessels along the US coast. As the Proteus continued on her course towards the Diamond Shoals Lightship, 34 miles distant, the Tanker Cushing appeared. The helm was turned hard to port and the whistle sounded, but the Tanker collided with the Proteus, striking her starboard, amidships and creating a gapping wound below the water line. Immediately after the collision a crewmember, who was a fireman, panicked and leapt overboard to be lost. He would be the only casualty, besides the liner herself. Captain Boyd ordered and coordinated a successful abandoning of the sinking vessel and was the last person to leave the ship. All 12 passengers and the 82 crew were aboard the damaged but still afloat Cushing within the hour. The collision occurred around 0200 in the morning and a short while later the Proteus went to the bottom in 125 feet of water almost 25 miles south of Hatteras inlet. 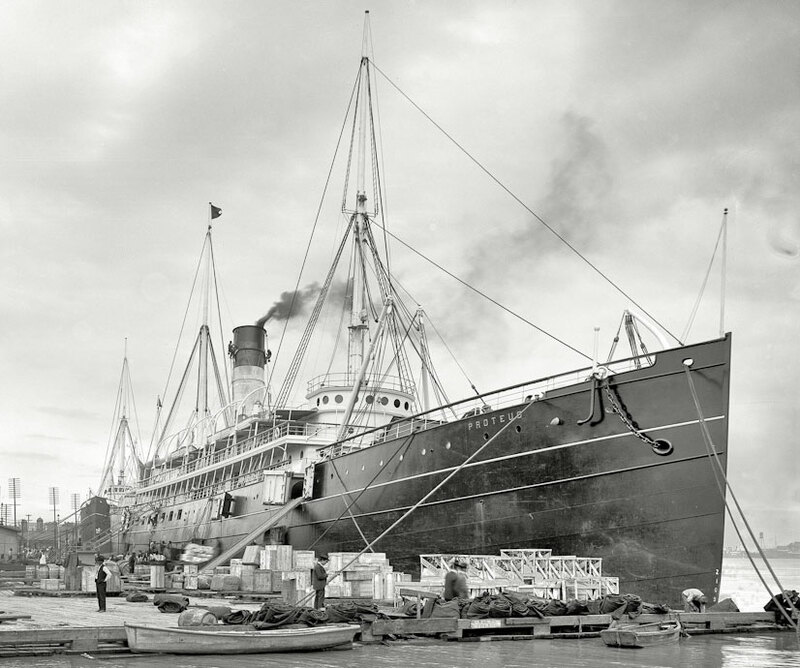 Photos of the SS Proteus loading cargo at the New Orleans wharf. Circa 1903. 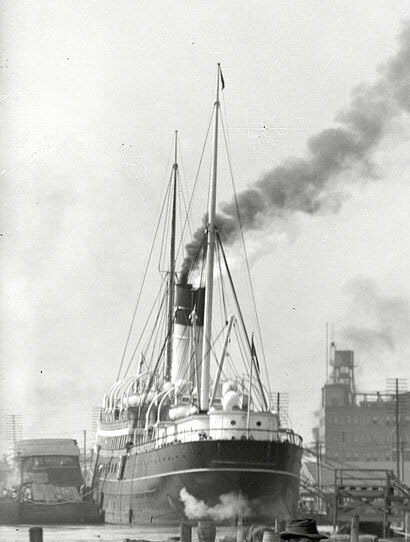 The stern shot is a detail from a larger photo of cotton being moved and Proteus is in the far background. Photos from the Frank B. Moore Collection, Louisiana Special Collections Dept., Earl K. Long Library, University of New Orleans. Today, the Proteus lays on a hard sandy bottom with a list to port. She is intact from Bow to Stern with the port side low in the sand and sections of the starboard hull rising almost 20 feet from the bottom in places. The bow of the liner is identifiable though not all of it remains and what is there points towards the surface, rising about 25 feet from the bottom. Aft of the bow divers will encounter a large windlass in the center of the wreckage immediately adjacent to the remains of the cargo hatches. Just aft of this area and towards the port side of the vessel is where many divers have been lucky enough to recover china and silverware. It takes a sharp eye and knowledge where to dig, but dinnerware is still sometimes recovered from this galley area. 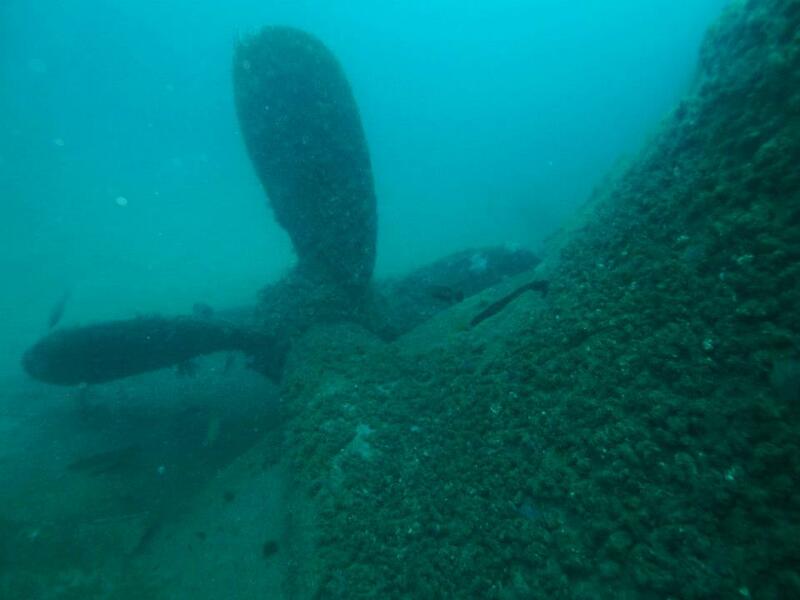 This photo shows the prop shaft as it leads from the engine towards the stern. Photo taken May 2013 by Marc Corbett. From the boilers to the stern is where the Proteus is most impressive and looks like a shipwreck as she still rises over 30 feet from the sand. The large boilers dominate the wreck amidships as they are about 25 feet in diameter and 30 long, one smaller boiler has rolled off it's beds and now lays askew on the port side. Just aft of the boilers, the triple expansion engine has fallen over towards the port side and lays almost on it's side but is still attached to the propeller shaft. The engine and associated machinery are covered in a variety of hard corrals and other growth, but the shapes of gears, connecting rods and valves are still easily discerned. Very large eels are often found inhabiting the area of the engine and boilers and can be seen here with regularity. The propeller shaft leads from the engine to the stern and though exposed for much of it's length, it is still enclosed in the shaft alley many places, though the casing is rusting away in many places. 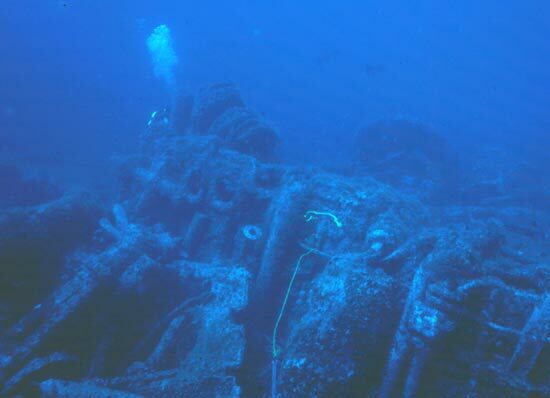 Photo taken by diver Joe Poe, shows the earlier condition of the Proteus stern before she was rolled over to the port side by a Hurricane in 2012. The very stern section has the highest relief on the wreck site and used to terminate in a large bronze steering quadrant being the highest point on the wreck site. The hurricanes of the 2012 season rolled the stern portion of Proteus to her port side so that the Steering Quadrant now touches the sand. This has reduced to overall height of the wreck from the bottom by about ten feet. It is also at the stern, in the washout at the propeller and the deepest place at the wreck, that many of the sharks frequently found on this wreck seem to hang out. On most dives at least one or two very large sandtiger sharks can be seen here, but on many occasions there may be too many to accurately count and we have dived the Proteus when the number of sharks ran far into the hundreds. Besides the sharks, the Proteus can be relied upon to hold a wide variety of sea life with a large number of big groupers often present. 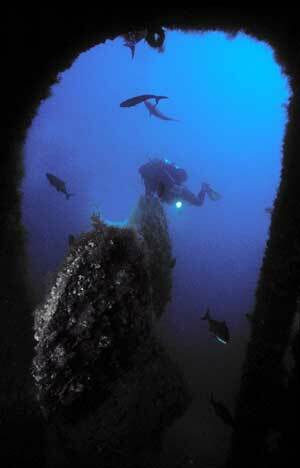 The water conditions at the Proteus are most often very good with warm and clear waters over the wreck. This is due to the location far from the beach and near the Gulf Stream edge in the Summer months. This advantage also comes with the fairly consistent possibility of at least a surface current and one that generally continues through the water column to the bottom. 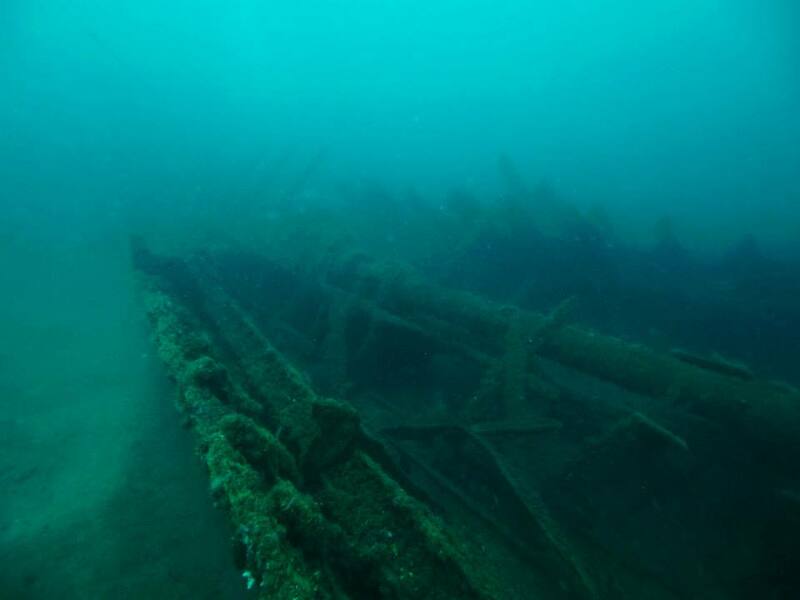 The standard current flows from the port bow of the Proteus across the wreck at a slight angle towards the starboard stern quarter. The high relief of the wreck site provides plenty of structure for a diver to tuck out of the current once on the bottom but can make the travel to and from the wreck a challenge. However, like all wreck sites in the Hatteras area, we have experienced many days when there is absolutely no current at all and the anchor line drops straight down to the wreck. 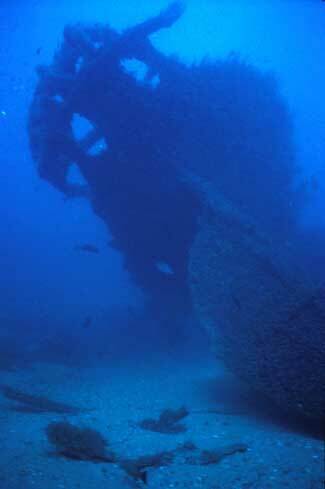 The Proteus propeller is one of the larger ones that a wreck diver might encounter. Each blade is about ten feet in length. Photo taken May 2013 by Marc Corbett. Although the Proteus has been dived a great deal since her location was discovered in the late 1970's, she is still an impressive shipwreck site. 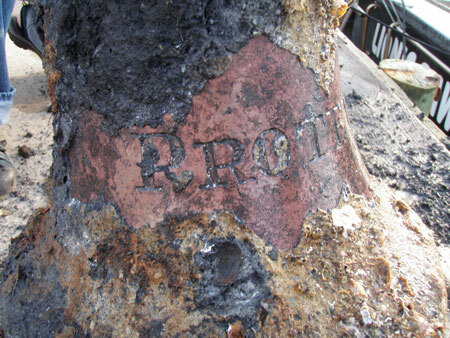 In the years immediately after discovery, she was known as a wreck that produced a great number of artifacts. The most sought after being the large rectangular porthole windows that had a stained glass transom as well as the china and silverware. Although those items are now harder to find, she still has many interesting features and artifacts to discover. The Proteus is one of our most requested wreck sites as it is usually in very clear water and has so often offered spectacular diving. If you are ready for a dive that you will not forget, the Proteus is waiting for you. Ship's Bell from the Proteus which was recovered May 2013. Photo by Dive Hatteras. Many of the Rectangular porthole windows were recovered from Proteus in the late 1970s and 1980s. These are displayed on the foredeck of the original dive boat Olympus. Photo from Alan Russell. Divers Charlie Bulloss and Alan Russell with a ship's bell from the Proteus. They recovered the bell May, 2013, when diving together on the shipwreck. Alan spotted just a bit of the edge of the bell sticking out of the sand and immediately knew what it was. It took two 90 minute dives to dig it out and then another short bounce dive to lift it to the surface. The Prop of Proteus is really big and the photo op for many cameras. Photo by diver Joe Poe. 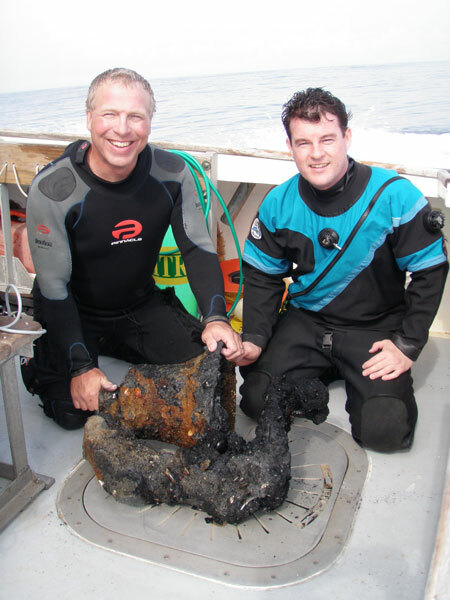 The bronze Capstan Cover plate was recovered by Captain George Purifoy, dive boat Olympus. This artifact is also seen above in the photo of the large rectangular windows. Photo from Alan Russell. More information and excellent photographs of the Proteus can be located on Paul Hudy's BFDC web site about NC shipwreck diving as well as in Gary Gentile's book, Shipwrecks of North Carolina(South).